Semolina and I did not start out on a good footing. For a few years when I was young I attended a convent – not as a nun, but as a pupil, and the nuns had a habit of being very strict. You had to eat every morsel on your plate and were not allowed to leave the table until your plate was clean. The food in the early 80’s was not something you would particularly blog about and the puddings that were dished up to us were well, how can I put this politely, not that appetising. The gruel that I particularly disliked was sloppy semolina with a dollop of sweet jam. I found it so hard to eat that on one occasion after the dining hall had emptied and I was sitting all alone and the minutes were ticking by I decided that when Sister was not looking I would deposit the contents of my bowl into my pocket. I did it like a stealth ninja and no one found out, other than my mother, who is such a sweetie she didn’t seem to make much of a fuss. 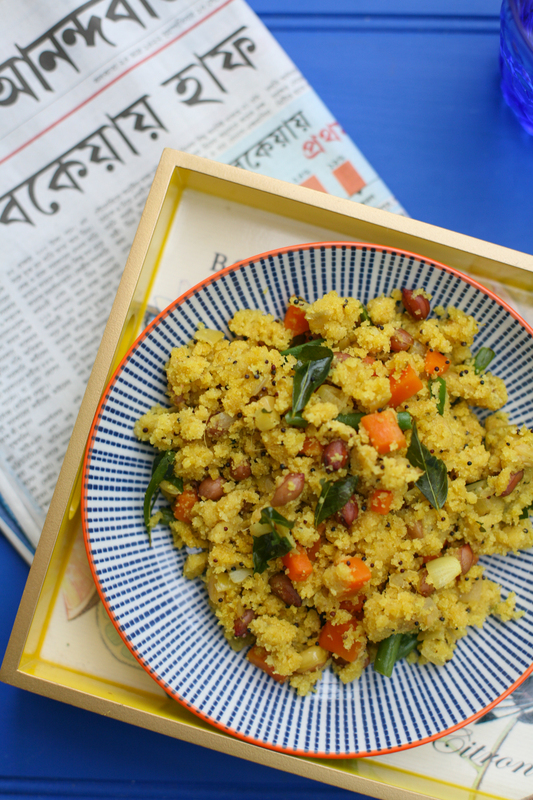 Fast forward 34 years and I now love semolina – but only if I eat it the savoury way. 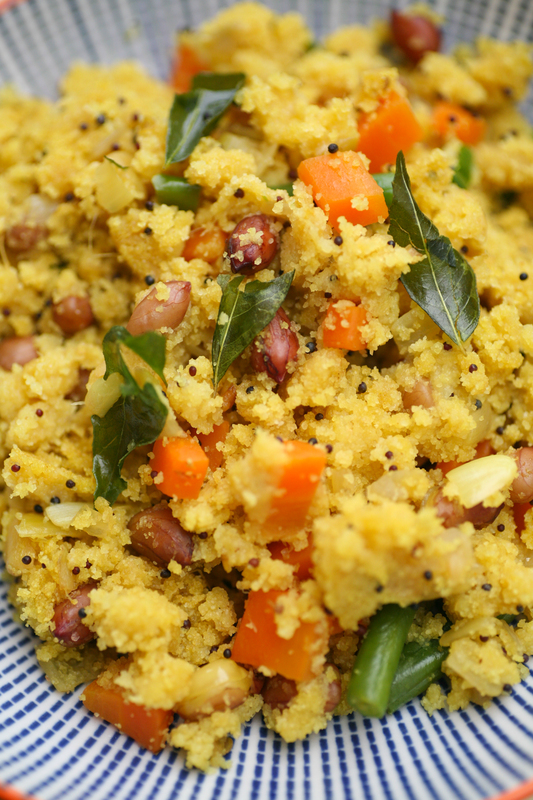 In India a hugely popular breakfast snack is spiced semolina known as ‘Upma’. It is so quick and easy to put together it takes minutes to create a really warming bowl of goodness. I eat it at any time of day in all honesty – breakfast, snack, lunch, supper – you name it, it is super versatile. You can also add whatever vegetables need to be used up in the fridge, so it’s a win win in my book. Heat a pan with the oil and when it is hot add the mustard seeds, curry leaves and fresh chilli. The mustard seeds will begin to splatter after 20-30 seconds so then add the shallot/onion and salt and lower the heat. Allow the shallot to soften for around 5 minutes. Add the fresh ginger and turmeric and stir gently. 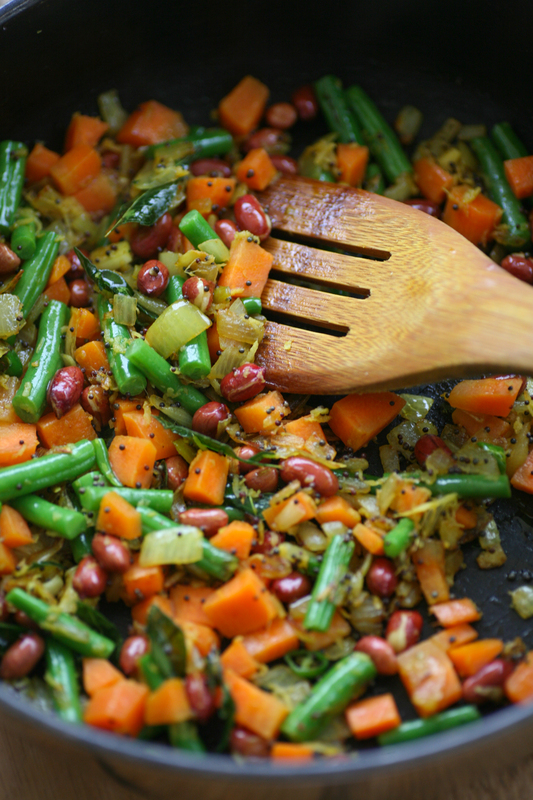 Now add the carrot and beans or another vegetable that needs using up along with the red peanuts. After 1 minute add the water and leave to simmer for up to 5 minutes or when the vegetables have softened. Add the semolina gradually and stir constantly so that it does not clump together too much. Once it has soaked up the water – you can add a little more water if needed at this stage – place a lid on the pan and switch off the heat so that it can steam for a few minutes before serving. 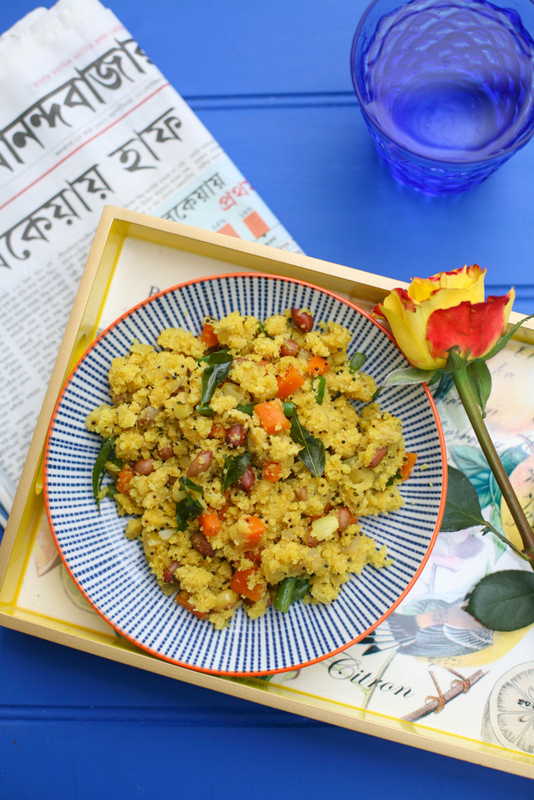 This entry was posted in breakfast, Vegetable, Vegetarian and tagged breakfast, snack, upma, vegetarian. Bookmark the permalink.